This article is a repost from our old blog – originally dated January 2008. I have debated for several days about whether or not to post this random spirit encounter but have decided that with all of the sensationalism and misguided statements out there it would not be unreasonable to add my own small voice to the mix in the hopes of being a wee bit more sensible than the general cacophony on the subject of Heath Ledger’s recent passing. Regular readers of my blog will know by now that we, meaning Vera and Serge, have been traveling in the UK for the past couple of weeks. During our brief but expensive trip to London we did a fair amount of walking, despite their fantastic public transport system, and happened to stroll through an area of London called Clerkenwell while we were out and about. As I was overwhelmed by the hustle and bustle of the city I didn’t notice too much in the way of spiritual activity while we were there. When we returned to the relatively quiet and slower-paced area of the city where we were staying, however, I began to feel that there was a spirit trying to voice something. I brushed it off as we settled down to have dinner and didn’t really attempt to tune into it until I was getting ready for bed later in the evening. This article is a repost from our old blog – originally dated June 2008, a point in time when we were living in England. Well, we decided to take a day trip yesterday and ended up choosing a trip to Bath. Bath is historically one of Britain’s top tourist destinations and was the playground of many a Regency well-to-do family. 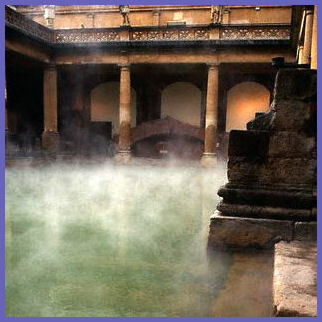 Of course Bath is not a new town, it and the healing springs that bubble up from beneath it’s ground have been sacred for thousands of years. 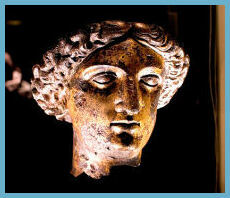 In the first century A.D. the Roman invaders wrestled control of these healing waters, sacred to the British Goddess Sulis, from the hands of the local Duboni tribe. After gaining control of the hot springs, the Romans set about subduing its flow and controlling access to the waters by erecting a complex of temples and baths, the remains of which can be visited today. I find it ironic that the very thing which could make a modern Pagan angry with the Romans, the restriction of access to the spring, is now what has guaranteed modern visitation to its site. If not for these Roman ruins, the spring would most certainly be capped and unknown, running anonymously beneath this modern, retail-carnival of a city. I must admit that at the Roman Baths, the temple complex and bathing rooms, some of which take a bit of imagination to picture, are truly exquisite. The presence of both hot and cold natural baths in one place is magnificent. The circular cold pool and the half moon “hot tub” type of area were both most appealing to me. The great bath, heated by the forces of nature to about 115˚ Fahrenheit, was awe-inspiring. I can only imagine what it must look like at night with the fire lanterns lit. Against the rules, I put my hand in that warm healing water, dedicated to Minerva, the Roman equivalent of the British Goddess Sulis. This article is a repost from our old blog – originally dated July 16. 2008. As a part of the channeling for our book manuscript I have been branching out and accessing new sources of information. Attempting new things is always a bit daunting, especially when you don’t know what to expect, but succeeding in new areas of channeling is always very exciting to me. There have been many descriptions of what this place looks like by those who supposedly have visited it. You will find that these descriptions vary widely and that those which bear a striking resemblance to one another do so because a person has read widely about the Library before attempting to go there. I follow a different path, as I tend to absorb only the most perfunctory information about psychic phenomena before I attempt it. I just don’t want the wealth of other people’s opinions to cloud what I might experience. 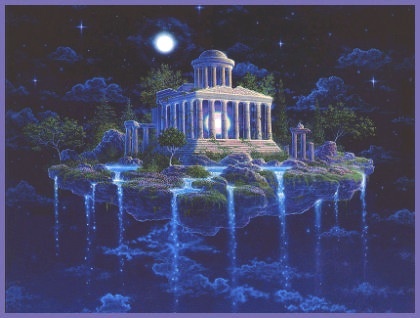 We are lifelong spiritual seekers and we feel we have been tapped by the Universe for a unique mission: to bring more loving light energy into the modern world and to uncover ancient mysteries that belonged to our ancestors — to help us all during the transition to a more empathic future world. 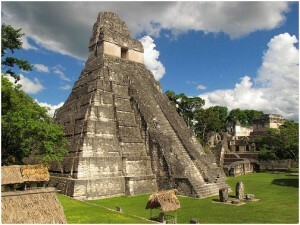 Our souls are calling us to Guatemala, to unwind from our book writing marathon and to explore and collect the sacred wisdom lying dormant within some of the world’s most sacred ruins and ecological wonders — Tikal. Vera will use her time at Tikal to enter a trance state and channel the spirits of Tikal’s original inhabitants, priests and builders. Having already created a channeled connection with an ancient Mayan priest, Sadayin, she seeks now to gain a better understanding of the mystical beliefs of the everyday Mayans who lived at Tikal. Vera will also ask for the Mayan priests to share their insights about the coming events for 2012 and beyond.